Joseph Stalin had said: "A single death is a tragedy; a million deaths is a statistic." With the death of Saudi-born journalist Jamal Khashoggi in the Saudi Embassy/Consulate in Istanbul and the international furore over the incident, it appears that Stalin's words are truer than ever, all the more so with almost 15 million people in Yemen on the brink of famine with the civil war going on right next door to Saudi Arabia. There is no doubt that what happened to the Saudi dissident is unacceptable; however, the incident seems to have had so much resonance in the international media that the sad plight of millions in Yemen, where many parents have to choose which of their young children they'll let die first, has been obscured from focus. Closer to home, or rather, at home, we have the plight of the Rohingya refugees, who it seems have little or no chance to go back to Myanmar anytime soon. Now reports are coming out that the United Nations has found that genocide is still ongoing against the Rohingya in Myanmar. Thus, the environment for their safe return does not exist, and their return anytime soon becomes apparently impossible. Perhaps another additional one million people in a country with a population of 160 million plus apparently make little difference. However, on humanitarian grounds, and as a country that witnessed more than a million of its own citizens become refugees in India during the Liberation War in 1971, it would be inhuman not to host the Rohingya. Of the Bangladesh population of over 160 million, over 10 million (i.e. 1.0 crore) are working abroad according to statistics available from the Bureau of Manpower, Employment and Training (BMET) under the Ministry of Expatriates' Welfare and Overseas Employment. The major problem with the BMET data, according to most researchers and people involved with the sector, is that it does not factor in the number of workers who have returned to Bangladesh and ignores outflow of workers who are not registered with it. The other problem with BMET data that is perhaps as not widely reported is that it does not capture various outflows as it only captures the outflow of workers who register with BMET. A few examples will provide a clear idea of what goes missing from the data. When a cousin, an electrical engineer graduate from the Bangladesh University of Engineering and Technology (BUET), went to work in Malaysia as his office was relocating there, he had to go through BMET and was registered as an outbound worker. Readers will be spared the details of how he had to go through the application process and certain hassles - he mentioned there were about 50 queries, which he had no time to solve as his departure date was getting delayed again & again due to the clearance procedure, or how he "resolved" the queries (i.e. "speed money"). However, a few years later, when he came back to Bangladesh, he was not registered as a returnee. Then when he went to the United States a few years later, the BMET did not have a record that he was going abroad. Yet if he stays abroad for a prolonged period, he becomes an expatriate, who can potentially remit money back. Many students who go to study abroad, especially in the US and Canada, often do not return and stay on and work in those countries. The BMET has no way of capturing that data. Remittance inflows from the US are the third highest source of formal inflows into Bangladesh (and have been so for quite some time), yet if one looks at BMET data for outbound workers to the US, the number is not even mentioned (though it may be lobbed under "Others"). The same holds for the majority of Bangladeshis who have gone to the United Kingdom and work there; the UK was almost always among the top five highest sources of formal remittance inflows into Bangladesh for many years, though in recent years there have been instances where it has fallen out of the top five so. It has, however, remained well within the top ten sources of formal remittance inflows into Bangladesh. In 2017, the UK was in 6th place behind Saudi Arabia, the UAE, the US, Kuwait and Malaysia in the chronology of top sources of formal remittance inflows into Bangladesh. With Brexit coming soon, and many predicting the fall in the value of the UK Pound Sterling vis-à-vis the US$, it will be interesting to see how the formal flow of remittance into Bangladesh from the UK is affected, if at all. My best friend from the Institute of Business Administration (IBA) pursued a major in Development Management despite being a medical doctor by background and is now working for a United Nations entity as an international staffer in a regional country. This is also not captured in BMET data, even though my friend is working as an expatriate Bangladeshi and sends remittances. So even though remittances are sent in this case of my friend, there is no record of my friend being an expatriate Bangladeshi. This makes my friend one of the many "ghost" remittance senders for Bangladesh - someone who exists in reality, but not so in BMET records! Then there is the example of the hundreds and thousands of Bangladeshis who have left for other countries illegally. Stories of people from Bangladesh who take tourist visas to go to countries and then go on to third (or fourth or fifth) countries from there are also people who do not get captured in the BMET statistics. Once at an International Labour Organisation (ILO) workshop, I was astounded to hear that more than 100,000 Bangladeshi workers are in Azerbaijan working on establishing oil pipelines; they had gone through a different country (as there are no direct flights to Baku from Dhaka), and were thus not included in the number of outbound workers for those years. These are but a few examples of the hundreds and thousands of people not captured by BMET who work abroad and send remittances back into Bangladesh and thus play an important role in the economy and help in maintaining a decent and stable exchange rate. Some put the number of expatriate Bangladeshis at over 20 million, which would not be surprising. According to BMET statistics, which track the official outflow of workers from the country since 1976, the year 2017 was a record year for Bangladesh as more than one million (1,008,755) workers went abroad with work for the first time in the history of Bangladesh. In an ILO workshop held at BMET earlier this year, I had pointed out that while this is indeed a remarkable achievement, given the target of sending between 1.2 million to 1.5 million workers abroad in 2018, the task was likely to be challenging. The problem with a very successful year is that it raises the bar for the next year and the years to come. I had raised the issue of whether the Bangladeshi Embassy in Saudi Arabia had increased their capacity to deal with an additional 550,000+ workers in that country in just one year, as more workers meant in all likelihood that there would be a higher number of problems faced by the expatriate workers. This was the first instance that the number of Bangladeshi workers going to a single country exceeded 500,000 in a single year in the history of the country; the previous highest was 419,355 workers who had gone to the United Arab Emirates (UAE) in 2008. Incidentally, the year 2008 held the record for the highest number of Bangladeshi workers going abroad (875,055) in a single year prior to 2017, when that number was exceeded due to the outflow of a million plus workers. Newspaper headlines in recent months have highlighted the number of returning migrant workers, especially the number of female migrant workers returning from Saudi Arabia. While the numbers may not be very high in terms of percentage of outbound workers, the incidents of harassment and torture are alarming in the case of female migrant workers. However, this does not seem to have stopped the outflow of female migrant workers to that country, as the total number has exceeded 100,000 for three consecutive years (2015, 2016 & 2017), with a steady increase, though it seems that mark will be missed this year. What is alarming is that the outflow of workers to Saudi Arabia has fallen significantly. Since more than half the outbound migrant workers who left Bangladesh in 2017 are workers who went to Saudi Arabia, a significant decrease in the number of workers recruited by Saudi Arabia in 2018 is a major cause of concern as it affects the overall outflow of workers from the country. The number of outbound workers from Bangladesh in the first nine months of 2018 to Saudi Arabia was 187,223; at the current rate, the number of outbound workers from Bangladesh to Saudi Arabia will be slightly less than 250,000, if the outflow continues at this same pace through the end of December. That would be less than half (approximately 46 percent) the number of Bangladeshi workers who left for Saudi Arabia in 2017, making the record outflow of workers from Bangladesh in 2017 more of an outlier than the norm. Through September 2018, in terms of the number of outbound workers from Bangladesh for 2018 thus far, Malaysia is in 2nd place, with 142,080 workers going there from Bangladesh during the first nine months of 2018. 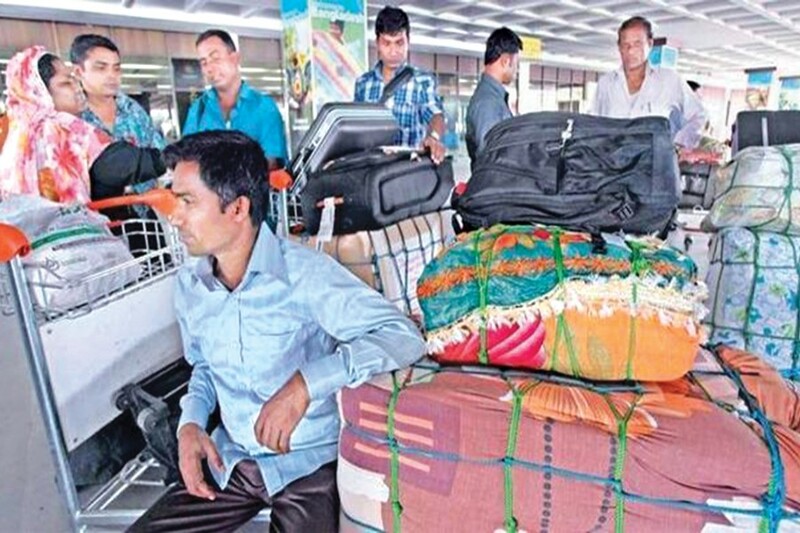 Outflow of outbound workers from Bangladesh to no other country has even touched 60,000 in 2018 thus far; thus it seems only Saudi Arabia and Malaysia will be the only two countries to receive six-digit inflows of migrant workers from Bangladesh, even though Oman, Saudi Arabia and Qatar had each taken in 100,000+ workers from Bangladesh in 2016, with Saudi Arabia being the sole country to take 100,000+ workers from Bangladesh in 2017. As of the end of September, 2018, the total number of outbound workers from Bangladesh to all countries of the world in the first nine months of the calendar year was 555,393. At the current rate, the number of outbound workers from Bangladesh will be slightly over 740,000 if the outflow continues at the same pace this year through the end of the year. It is also a cause of concern that the second largest source of remittances, the UAE, has pretty much stopped taking in workers from Bangladesh since 2013, apparently as a result of Bangladesh voting in favour of Russia instead of the UAE, for hosting the World Expo 2020, which has proved a very high price to pay for the country. For the economists and experts who were saying that the fall in oil prices was responsible for the significant fall in the outflow of workers to the GCC (Gulf Cooperation Countries) in recent years as well as for the fall/slowdown in remittances from that region, one cannot but wonder why more than 550,000 workers would go to Saudi Arabia in a year (2017) when oil prices were below US$40/barrel, while this year (2018), the outflow of workers is likely to be half of that when oil prices are hovering around US$80/barrel, double the rate of the previous year. There are, obviously, other factors at play here for determining the number of outbound workers and the flow of remittances, though remittances this year into Bangladesh are on a relatively significant upswing. The importance of sending a high number of workers abroad for Bangladesh is two-fold: one is that although more than two million workers enter the labour market of Bangladesh each year, the country does not have the capacity to absorb these workers with jobs. Despite the seven per cent plus gross domestic product (GDP) growth rate of three consecutive years, job growth has been slow. There is also the factor of high existing unemployment and underemployment, which may not appear obvious from official figures, but is commonly acknowledged to be so. Thus, the need for workers to go abroad from Bangladesh becomes all the more important. The other important factor is that the remittances sent by the expatriate workers go a long way in covering the trade imbalance, as Bangladesh has always imported more than it exports; thus the inflow of remittances helps keep exchange rates stable with foreign currencies. This is all the more important now as the trade deficit ballooned to more than US$18 billion in the just concluded fiscal year, doubling in just a year (from $9.5 billion in FY2016-17 to $18.3 billion in FY2017-18). The current account is in a high deficit (almost US$10 billion), whereas is has generally been positive in the recent past. The pace of imports has far outpaced the growth in exports from Bangladesh, and all this is putting pressure on the exchange rate. Major factors include higher capital machinery imports, higher cost of oil imports and even rice imports in a year when there was no need for such. At the end of September, 2018, the foreign exchange reserves were slightly below US$32 billion, the lowest since February, 2017. Money exchanges were selling the US$ at Bangladesh Taka (BDT) 86.5/$ in late October, 2018. With national elections coming up, many worry that the US$ would go closer to BDT 90 by the end of the year as money laundering has increased significantly in election years in the country. This is perhaps not as bad as the recent fall in the Turkish Lira vis-à-vis the US$, or less alarming than the fall of some other currencies of the developing major economies (e.g. India); however, it poses serious headaches for policy-makers in Bangladesh. This also means that the private sector entities which had taken foreign loans to avoid the double digit rates of interest a few years ago will end up paying double digit rates due to the devaluation of the BDT. The heavy dependence on quick rental power plants is significantly responsible for the higher cost of oil imports, more so because even if Bangladesh imports the same amount of oil as it did in FY2016-17, it will cost almost double that amount to import the oil in FY2017-18. With the US placing sanctions on Iran and in the initial phases of the Saudis denying responsibility for the Khashoggi murder, and threatening to use their oil exports as a weapon in the face of possible sanctions, oil prices are likely to go up or at the very least stay at the same levels. This will prove very costly for Bangladesh, all the more so as the more common sources of power supply have not come up at the desired pace due to slow implementation, a common problem that generally plagues mega-projects (like the Padma Bridge, which even seems unlikely to be complete by now) of the government. No major coal-powered plant has yet started production, even though some should have been operational by now. Despite the significant improvement in power generation and production, with occasional power outages even happening in the capital city, one has to wonder just how badly the significant increase in international oil prices will continue to hurt the Bangladesh economy. With the local power generation capacity supposedly exceeding 20,000 MW, actual generation is only in the range of 11,000 MW, a testament to the inefficiency in power production (with only 55 percent utilisation). Of this actual generation, between 30 per cent and 40 per cent is from quick rentals. So there is likely to be pressure on imports, the exchange rate and on the economy. With national elections scheduled for late this year, one cannot but hope there are no more dark clouds on the horizon.